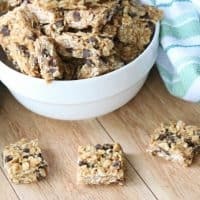 These healthy oatmeal chocolate chip no bake bars are the perfect healthy snack to hit the spot when you’re craving something sweet! With just 6 ingredients, they are quick and easy to make too. When it is hot outside the last thing I want to do is turn on the stove and heat up the house. 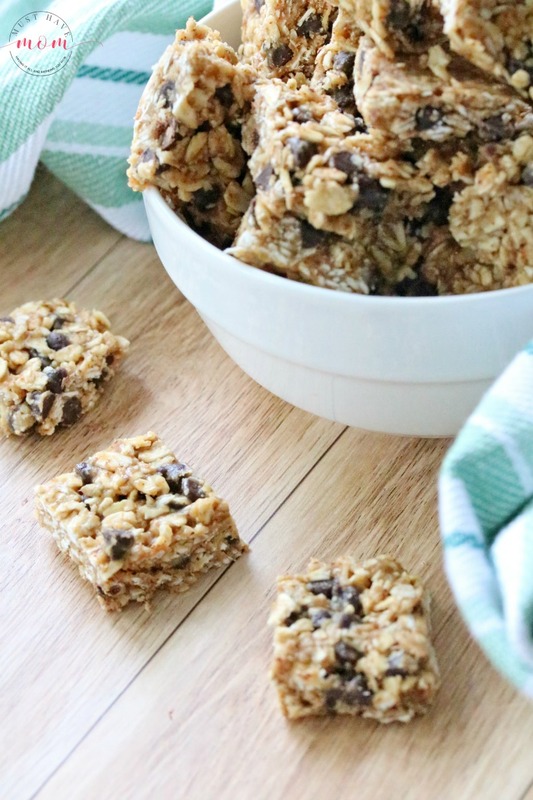 These healthy no bake bars taste amazing and are quick and easy to whip up! Place one cup of oats into a mini food processor and grind until almost a flour. 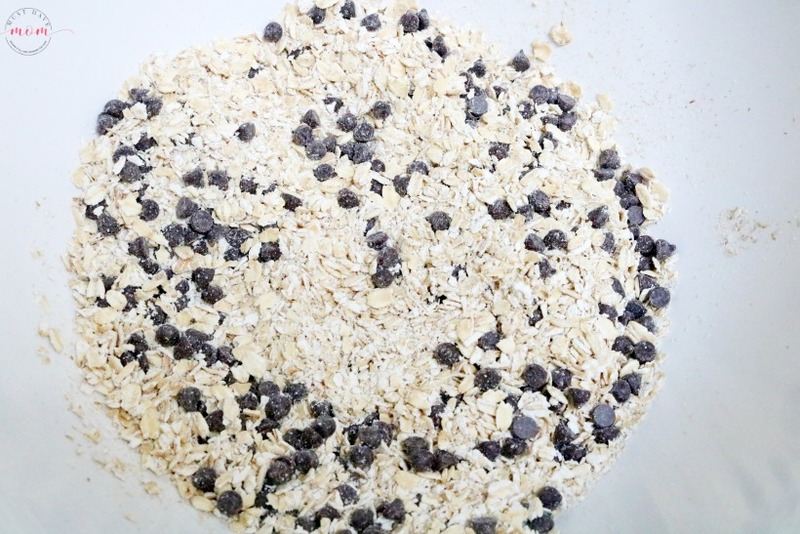 Place the oats, sea salt and chocolate chips in a large bowl. Add in the almond butter, coconut oil and maple syrup. Mix until everything is coated. Add in the last three tablespoons of oats for texture and mix. Line an 8×4 baking tin with parchment paper and pour the mixture in. Use a silicone spatula to smooth the mixture and press it down. 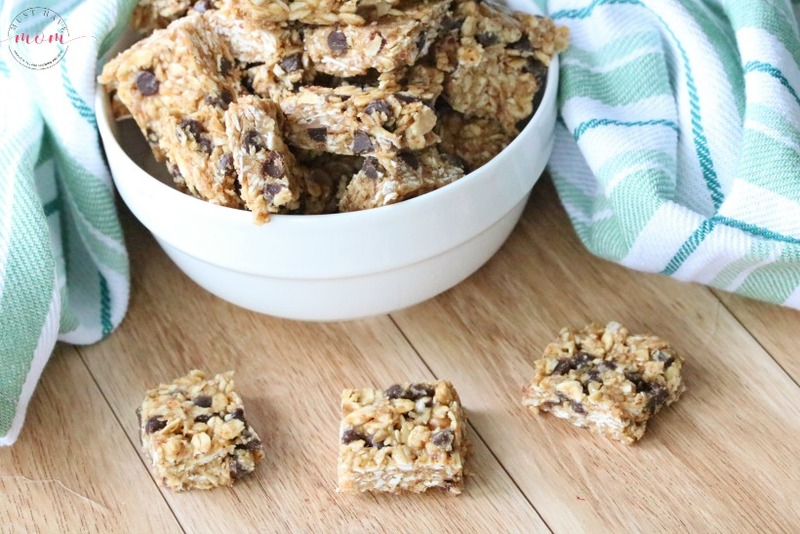 Freeze for 10-15 minutes then cut the no bake bars into mini squares. Store the healthy no bake bars in the freezer and take out before you are ready to eat them so they can soften a little. Makes 24-26 squares. 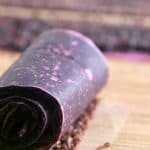 If you like these healthy no bake oatmeal chocolate chip bars, then try these no bake energy bites, no bake granola bars, or this no bake icebox berry cheesecake. 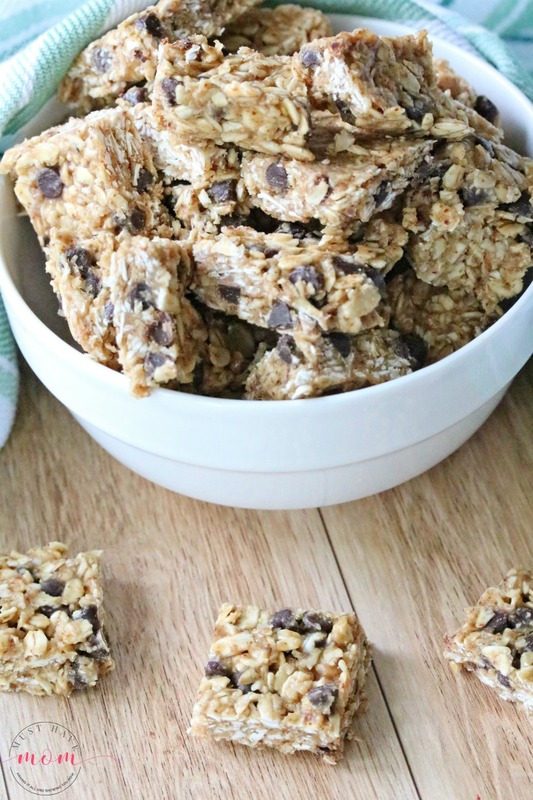 These no bake bars are healthy and easy to make with just 6 ingredients! Place one cup of oats into a mini food processor and grind until almost a flour. 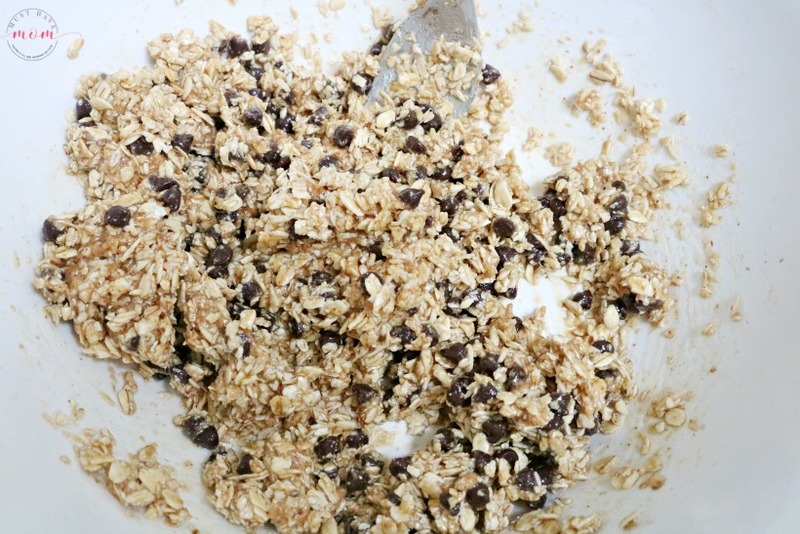 Place the oats, sea salt and chocolate chips in a large bowl. Add in the almond butter, coconut oil and maple syrup. Mix until everything is coated. Add in the last three tablespoons of oats for texture. Mix. Line an 8x4 baking tin with parchment paper and pour the mixture in. Use a silicone spatula to smooth the mixture and press it down. 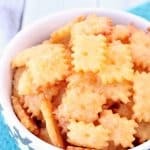 Freeze for 10-15 minutes then cut into mini squares. These look really good. We love granola bars. I love how easy these are to make. 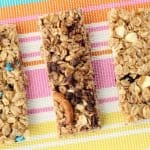 We LOVE granola bars of any kind around here too! Even better if they are easy! Those look delicious and so easy to make. I am going to give this recipe a try. Thanks! These sound delicious. I love they are easy to make. I will definitely try this recipe, looks easy enough. 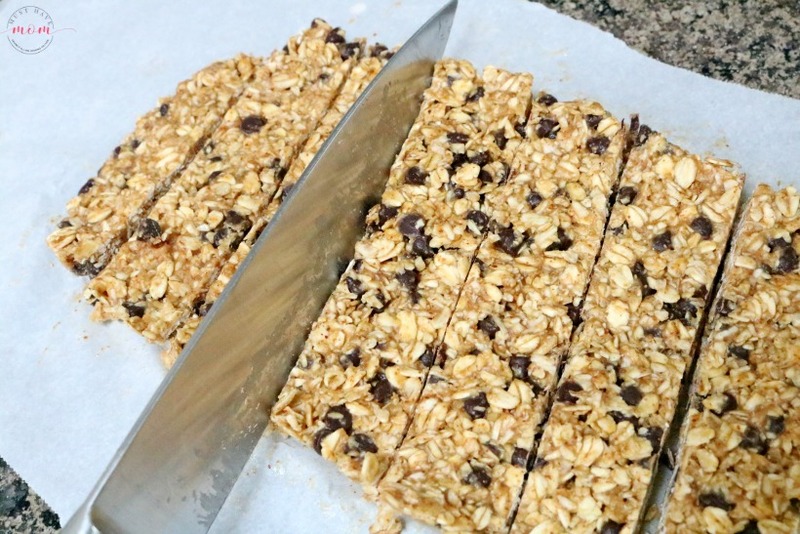 Now you can wow your friends by letting them think you baked homemade oatmeal bars in the summer! 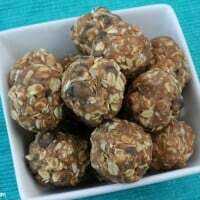 I am going to make your Healthy Oatmeal Chocolate Chip No Bake Bars!! 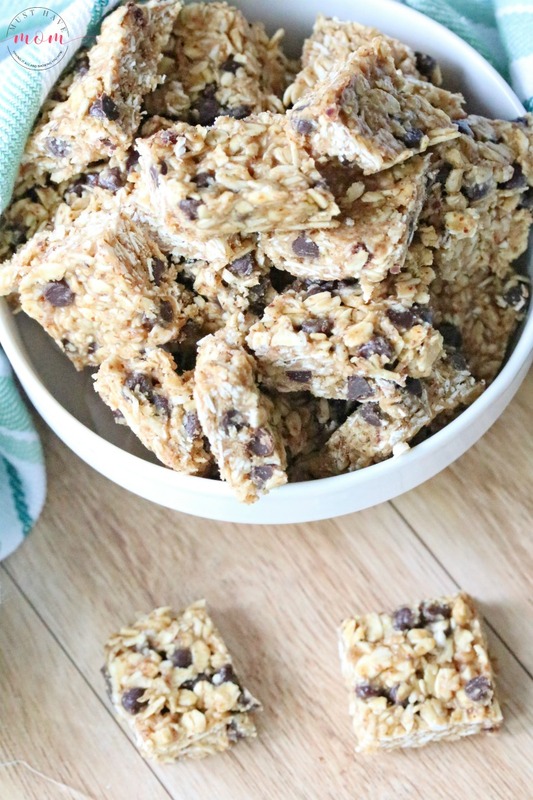 They look delicious and I love no bake recipes, especially in the Summer months. Fantastic! Let me know how you like them. Great! Healthy and no baking. Perfect any time of the year. 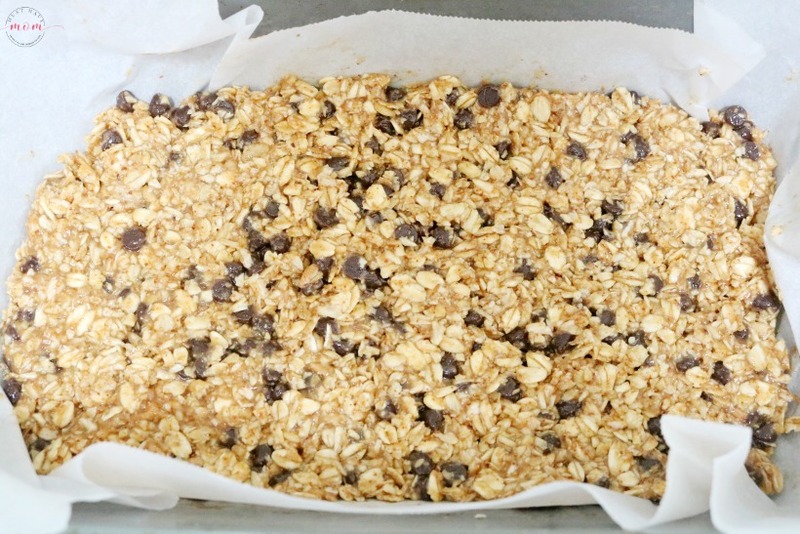 I love no-bake bars and am always experimenting. This sounds like a nice recipe to try, and I actually have all the ingredients! Yea! Let us know how they turn out! Thanks for stopping by.